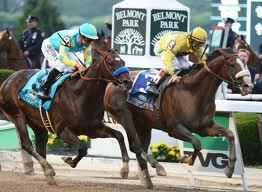 The Belmont Stakes (official site link) is the third and final leg in the United States Triple Crown. It is run 3 weeks after the Preakness Stakes race every year at Belmont Park in Elmont, New York. The race really becomes hyped up when there is a potential Triple Crown winner heading into the race. If a horse has won both the Kentucky Derby and the Preakness Stakes races earlier in the season then the Belmont Stakes race will have much more media attention and hype. The Belmont Stakes race is considered ‘The Test of Champions’ because it is the final leg of the Triple Crown and also because the 12 furlong distance is by far the longest race in the Triple Crown. The average attendance ranks fourth among all horse races in North America, after the Derby, Preakness and Kentucky Oaks, but when there is a potential Triple Crown winner the attendance sky rockets. The purse for the race is $1,000,000, which is the same as the Preakness Stakes, but half as much as the Kentucky Derby. The winner also receives the August Belmont Trophy. We recommend betting on the Belmont Stakes race at Bovada.lv. Bovada is the USA facing branch of the trusted Bodog sportsbook brand and one of the best online sportsbook for USA residents. Bovada offers 3% rebates on straight horse racing wagers and 5% rebates on all exotic wagers. You will also receive a free bet equal to 20% of your initial deposit. **It is important to note that Bovada.lv only accepts US residents. If you are from elsewhere you should sign up with Bodog.eu, which is the same brand, but meant for none USA residents. Check out our full Bovada racebook review here. The first thing you have to do is open an account at either Bovada.lv or Bodog.eu. Click here to visit Bovada.lv and then proceed to click on the ‘Join Now’ button to open an account. Next you will have to head over to the ‘cashier’ section and make a deposit in order to have funds with which to bet on your desired horses. Now that you have money online it is time to bet. If it is not yet race day you can find futures odds on which horse will win the race by clicking on the ‘Sports’ tab in the top navigation bar and then selecting the ‘Horse Racing’ menu from the left side bar. The odds at the sportsbook are fixed odds, which means your odds are locked in when you place the bet, as opposed to the parimutuel betting that is available at the racebook on race day. On race day you should click on the ‘Horses’ tab in the top navigation bar. Then select Belmont Park from the tracks in the left sidebar. Next you will have to select the post time of the Belmont Stakes race in order to bring up all of the horses and the possible bets. You can place win/place/show bets right away, or change your button selection to place exotic wagers. The Belmont Stakes is the oldest of the three US Triple Crown races, having been first run way back in 1867. The first Belmont Stakes race was held at Jerome Park Racetrack in The Bronx, New York and continued to be run their until 1890 when the race moved to Morris Park Racecourse. It wasn’t until 1905 when the new Belmont Park opened that the race moved to its current location. During 1911 and 1912 the race was cancelled due to anti-gambling legislation in New York and from 1963 to 1967 the race was moved to the Aqueduct Racetrack while the main Belmont track was renovated. Like the other two races at the Triple Crown, Secretariat owns the record at the Belmont Stakes by putting in a time of 2:24.00 over the 12 furlongs. This win was by 31 lengths, which is the biggest margin ever at the Belmont Stakes. Check out the Belmont Stakes Wikipedia page to learn more about the history of the race.